Learn more about starting a new watch in your neighborhood. Register Your Watch Group in 5 Easy Steps: Click Here. NSA is proud to present our NEW National Neighborhood Watch program. 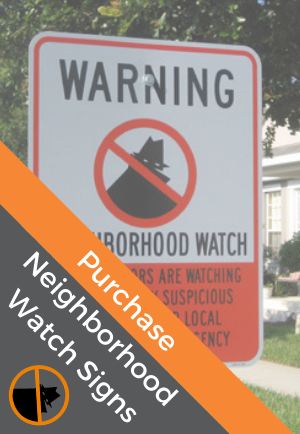 National Neighborhood Watch began in 1972 with funding in part by the National Sheriffs' Association, through a grant from the Bureau of Justice Assistance, Office of Justice Programs, U.S. Department of Justice. The funding from the grant has come to an end. But NSA knows how vital a program this is and we don't want to lose any of the movement or excellent resources we have available on this site. Our nation is built on the strength of our citizens. Every day, we encounter situations calling upon us to be the eyes and ears of law enforcement. Not only does neighborhood watch allow citizens to help in the fight against crime, it is also an opportunity for communities to bond through service. The Neighborhood Watch Program draws upon the compassion of average citizens, asking them to lend their neighbors a hand. The National Neighborhood Watch Program (formerly USAonWatch) is the portal for training to assist law enforcement agencies and their communities, technical assistance, resource documents, watch stories, networking, and assistance to the field. Since 1972, the National Neighborhood Watch Program (housed within the National Sheriffs’ Association) has worked to unite law enforcement agencies, private organizations, and individual citizens in a nation-wide effort to reduce crime and improve local communities. The success of the program has established Neighborhood Watch as the nation’s premier crime prevention and community mobilization program. Visible signs of the program are seen throughout America on street signs, window decals, community block parties and service projects.